The “connected car” theme loomed large at this year’s Consumer Electronics Show and I got a heavy dose of it while there. Aside from seeing the latest developments from both Chevrolet(s gm), Ford(s f) and others, I saw Ford open up its Sync App Link platform to developers — with over 1,200 signing up in the first few days — while support for Amazon’s Cloud Player(s amzn) app was announced. I’ve been slightly ahead of this curve though. Having bought a Chevy Volt to supplement our solar panels back in November, I’ve realized the early benefits of connecting the car and smartphone. For starters, there’s the entertainment aspect. My Volt came with a satellite radio trial, yet I haven’t tuned in to it. Not once. I know what the service is like: I was a subscriber a few years back and I enjoyed it. I just don’t see the need given that my mobile device has far more options for music. Options that I like, use every day and have refined for my musical tastes. For example, when I want my fix of the Beatles — which is nearly all the time — I use TuneIn Radio which has a 7×24 Beatles feed. It works with any any car that supports Bluetooth audio from a phone, so this isn’t a new technology; it’s just a convenient one made better by the explosion of available mobile apps. But I’m also taking this one step further. 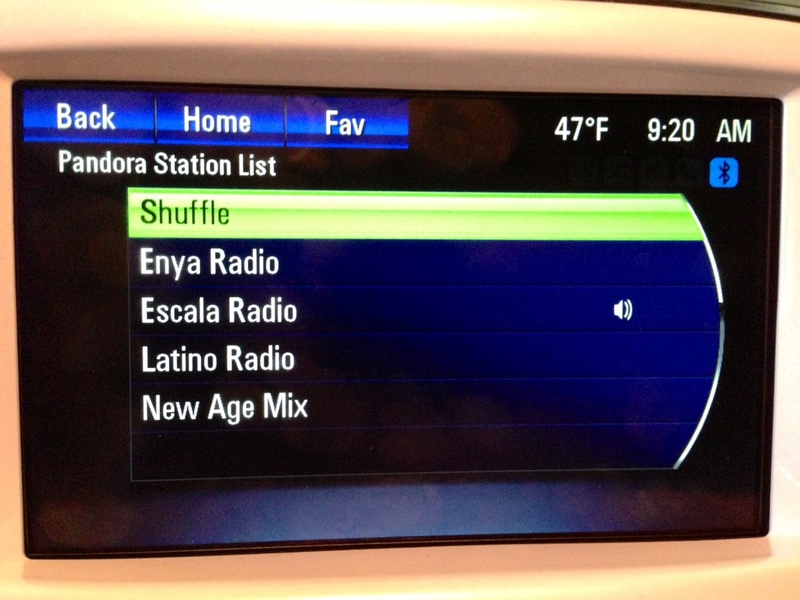 My Volt has integrated support for Pandora and Stitcher Radio on my phone. That means I can listen to my curated “radio” stations or podcasts. And because the apps are integrated, I can safely interact with them by voice or touch controls on the central console. It’s a breeze to skip tunes or give them a “thumbs up” on the Pandora smartphone app even though I’m using the car’s touchscreen to do so. Watch for more of this car to phone interaction in apps going forward. Entertainment is only part of the story though. 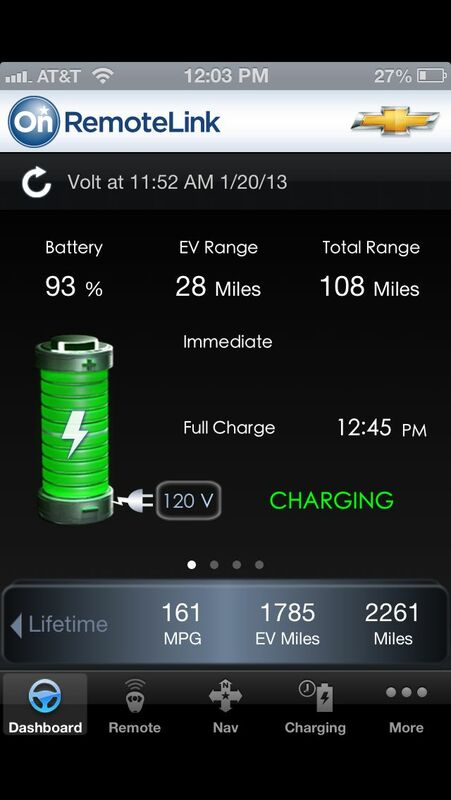 My smartphone helps me maintain, monitor and charge the Chevy Volt. I use the OnStar app with both my iPhone and Android phones to get real-time information from the car. Other information is more useful, however. Want to know how much range the car has currently or the amount of gas in the car? No problem. Tire pressures measured on the last drive? Yup, that’s there too. 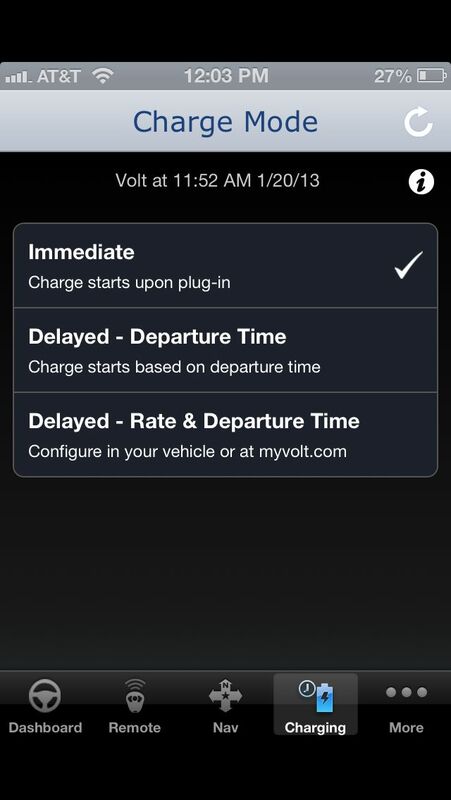 Even more useful is managing the car’s charging schedule. You’re given three options that you can select while in the car, but you can also manage them remotely from your phone. Immediately charge is the first, most simple option, meaning, charge the car as soon as you plug it it. Folks that have different electric rates at different times may want to schedule the charge. So you can do that based on the time of day — start charging at 9pm, for example — or you can set it for the charge to be 100 percent by a certain time. Maybe you leave for work at 7am; use this option and the will car dynamically start its charge to meet your deadline. The smartphone becomes a bit of a remote for the vehicle as well. Using the same OnStar app, you can remotely lock or unlock the car; handy if you walked away and forgot to lock it, for example. You can remotely start the vehicle or honk the horn and lights; helpful if you forgot where you parked. Want to send a route to the car? That’s no problem either. Using the app, you search for directions and shoot the navigation data to the car with the press of a button. Essentially, the connected car has become a new mobile platform, or an extension of the current smartphone revolution, if you will. A satellite or cellular connection in the car, plus Bluetooth, allows the car to interact on the web while the smartphone is the app platform that powers it. We’re in the early stages of the connected car market, but all the pieces are there for big growth and adoption: wireless technology, voice or touch interaction and smartphone apps to make our cars smarter.